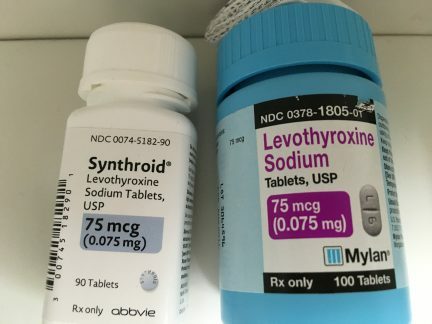 Levothyroxine is basically an human made or synthetic hormone for treatment of endocrine disorder and replacement therapy of principle thyroid hormone thyroxine (T4) that is made and released by thyroid gland located in the neck region. In newborn and fetus it is important for the growth and development of cells including bones and brain and in adult, thyroid hormone helps to maintain brain functions , utilization of food and body temperature. The drug is presribed for the treatment of hypothyroidism (low thyroid hormone release) and also used for the diseases treatment called goiter ( enlarged thyroid gland) which is caused by the hormone imbalances in the body. The drug is marketed and available under the brand name of synthroid, levothroid, levoxyl, tirosint and unithroid. The drug was first isolated in the pure form in 1914 at the mayo clinic by edward calwin kendall from extracts of hog thyroid gland and the hormone was synthesized by british chemist in 1927. Levothyroxine is the second most prescribed drug in United States. The drug levothyroxine sodium is available in various dosage from i.e tablet, an intramuscular injection and as a solution for intravenous infusion. Drug levothyroxine is available in different strenghts they are 12.5mcg, 25mcg,50mcg, 75mcg, 100mcg, 125mcg, 150mcg, 175mcg, 200mcg, 300mcg, 500mcg, 112mcg, 137mcg and 13mcg. The recomended dose of drug is 12.5mcg to 25mcg with gradual dose increment at 4 to 6 weeks intervals untill the patient achieves clinically euthyroid and normalized serum TSH levels. However, the dose varies from the type and severity of the conditions. calcium is a mineral and is present in more amount than any other mineral. About 99% of the calcium is stored in teeths and bones, although it is present in the muscles,blood and the fluid present between the cells. Calcium is essential mineral for building and maintaining bones and is also necessary for various other functions such as contraction and relaxation of blood vessels and muscles, the secretion of hormones and enzyme and nerve impulse transmission throughout the nervous system. Normally few calcium compounds have been used as a source of supplement i.e calcium carbonate, calcium citrate, calcium chloride and calcium citrate malate. The brand name of calcium carbonate are caltrate, tums regular strenght this belongs to class of antacids, minerals and electrolytes. The brand name of other compund calcium citrate are calcitrate and citracal belongs to class of minerals and electrolytes. The calcium compounds are available in various dosage forms such as oral tablets, oral powder, oral capsule, oral suspension, chewable and compounding powder. The recomended dose for calcium is 900 to 2500mg/day and it varies from the type and condition of patient. The drug levothyroxine mimic’s the function of endogenous thyroxine hormone which is the principle hormone for major endocrine disorders. The principle hormone thyroxine is released after proteolysis of thyroglobulin and subsequently secreted into the blood. The released thyroxine is Tetra iodinated tyrosine (T4) and in kidney and liver it is converted into (T3) triodotyrosine which is the active form. In order to increase the solubility of thyroxine hormone it binds to thyroid hormone binding proteins i.e. Thyroxine binding globulin and thyroxine binding prealbumin and thus the transport and binding of major thyroid hormone takes place in the nucleus and cytoplasm in the body. Thus it acts as an hormone replacement therapy and normalize the deficiency symptoms. calcium and calcium compounds are used for the calcium supplementation when calcium deficiency is observed in an individual . Calcium plays vital role in formation and maintanance of the bones. It is also useful as it binds with other minerals like phosphate, etc and aid their excretion or removal from the body. Acting as an antacid is its secondary action neutralizing stomach acids. Simply it acts as an external calcium supplement for the body deficient to calcium. levothyroxine absorption is primarily affected by taking calcium together . Therefore the drug levothyroxine and calcium are adviced to take at a difference of 4 hours or more and if taken together the dose of the drug should be adjusted appropriately as sometimes the dose required to compensate the thyroxine hormone required for the body is lesser but it increases significantly due to decrease in the absorption of the drug levothyroxine because of calcium. Most importantly doctor should be informed of all the medication an patient is taking such that any further drug-drug interaction could be avoided and pateint gets proper relief from symtoms. Decrease in the activity of levothyroxine is seen when taken with some minerals or multivitamins supplements, the absorption of levothyroxine is reduced such that the dose required by the body increases. Increased rate of elimination of levothyroxine from the body which leads into decreased levels of levothyroxine in the blood. Enzyme inducers stimulate the production of enzymes, which in turn increase levothyroxine from the body where in normal patient is maintained by normal feedback mechanism, increasing levothyroxine levels in the body. Some drugs when taken together causes changes in levothyroxine binding in blood. The binding protein Thyroxine-binding globulin(TBG) acts as an carrier of thyroid hormone when TBG levels are high in blood they trap the hormone and to compensate if secrets more thyroid hormone for normal functioning. The drug levothyroxine may increase or decrease the safety or effectiveness of the other drug by increasing or decreasing the level of other drug in the blood. cardiovascular adverse effects: Those effects which is driven my brain like anxiety, insomia, hypersensitivity, irritability,etc. Gastrointestinal effects: diarrhoe, abdominal cramps, vomiting, elevation in liver function test. Endocrine adverse effects: some times it causes decrese in bone density either by decreasing calcium absorption or increasing decalcification of bones. Calcium is a mineral supplement to compensate the deficiency of calcium in the body. But this mineral supplement may prove to be very dangerous with its side effects. Common side effects of calcium are nausea, vomiting, hypersensitivity reactions, consitipation, decreased appetite, dry mouth is one major side effect seen in most patient, more frequency of urination. emergency call for doctor if adverse reactions are swelling of lips, face, tounge or throat, difficulty in breathing, high levels of calcium in blood causing joint pain,stonach pain and kther general reactions.